Dr. Karickhoff is in his office five days per week performing this procedure. Mon. - Thurs. 9-3 p.m.
Click here to send Email to us. Dr. Karickhoff explains and shows laser treatment of floaters. Dr. Karickhoff’s contributions to Laser Floater Surgery; a patient’s examination; his laser surgery; and his comments afterward. Dr. Karickhoff is a pioneer in laser treatment of eye floaters, doing his first case in 1990. Soon he found this procedure was so helpful and safe for patients that he developed it into his sub-specialty, and he now performs this surgical procedure only. He has a national and international practice of the procedure, performing it over 6,000 times on patients from every U.S. state and 42 foreign countries (see International Patients page). Dr. Karickhoff wrote the first and only book on this procedure. 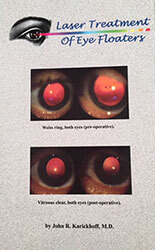 Through 490 sold copies, Dr. Karickhoff has taught the techniques to most of the eye surgeons in the world doing this procedure. (see Our Book page). Most laser treatment of eye floaters throughout the world is done with one of the surgical contact lenses designed by Dr. Karickhoff (see Our Contact Lenses page). He wrote and submitted the application to the U.S. Food and Drug Administration that gained their approval of ophthalmic YAG lasers for this procedure (see F.D.A. and Floaters page). Performed the first and only formal clinical research study of this procedure which was submitted to and monitored by the U.S. Food and Drug Administration (see Our Formal Floater Study page). Made possible the treatment of many formerly untreatable floaters in the peripheral vitreous with two prismatic surgical contact lenses he designed (see Our Contact Lenses page). Made possible the treatment of many formerly untreatable floaters in the posterior vitreous with (a) a long focal length surgical contact lens he designed and (b) his discovery of the Moses Maneuver which moves floaters away from the retina so they can be safely treated (see Our Contact Lenses page). Improved the treatment of floaters in LASIK patients with the 30 mm prismatic surgical contact lens he designed. His book includes 15 of his separate research projects on this procedure (each taking from one day to two years to complete). He has an extraordinary low rate of complication (total of 3 in 2,800 patients-no loss of any vision). One complication in the last 15 years. He has treated many physicians. He is the only physician selected by the American Academy of Ophthalmology to present this procedure at their international meeting. 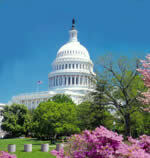 Has lectured on this procedure at Duke University and Georgetown University, and the Virginia Society of Ophthalmology. The Associated Press published an unsolicited article in 1,300 newspapers nationally on Dr. Karickhoff's pioneering work and contributions (see Associated Press article). Dr. Karickhoff wrote the book on laser treatment of eye floaters. Although intended for doctors, this book will be easily understood by patients. This is the world's first and only physician authored book on this subject. There are no courses, lecture series, resident training, or videos. This book is the sole source of extensive information on this topic. The book is based on over 6,000 operations by the author, our FDA/ IRB supervised study of 200 eyes (success in 92% of patients and zero significant complications), our many research projects, and techniques and devices the author designed for this procedure. Dr. Karickhoff performing laser floater surgery. Watch Dr. Karickhoff perform laser surgery for eye floaters and explain the procedure as he vaporizes the eye floaters. Dr. Karickhoff treats floaters with the laser every day. Click here to see Before/After Photos. Almost always the patient will be told that nothing can be done to help their vitreous floaters. Vitreous floaters can be treated in a 20 minute laser procedure in which there is no discomfort and no limitation of activities (see Our Procedure page). The floaters to a very great extent are obliterated by the laser, not just broken into many smaller floaters (see Science Background page). People unfamiliar with this treatment assume it to be risky, but the world medical literature reports a very low rate of complication (see World Literature page). In experienced hands, laser treatment of eye floaters is perhaps the safest procedure of intraocular eye surgery. The U. S. Food and Drug Administration when approving YAG lasers for this procedure, classified this as a non-significant risk procedure. My success rate has been 92% (see Our Floater Study page). My career rate of significant complications has been 0.10%. The only alternative to laser treatment of floaters is the vitrectomy procedure. With it, the rate of significant complications approaches 50 percent (see Vitrectomy page). Dr. Karickhoff had the procedure done on his eye. Of the 21,000 eye surgeons in the United States, only one other has the proper equipment and a large clinical experience in this procedure similar to Dr. Karickhoff (see Why Few Doctors page). We believe that we offer the finest laser available for this procedure (see Our Equipment-Our Laser page). We believe that we offer the largest selection of surgical contact lenses available for this procedure (see Our Equipment-Our Surgical Contact Lenses). Book: Laser Treatment of Eye Floaters by John Karickhoff, M.D. Dr. John Karickhoff gives a summary of his book: Laser Treatment of Eye Floaters. This is the world's only physician authored book that goes in-depth into the procedure of treating eye floaters (aka vitreous floaters) using laser technology. An Associated Press article about Dr. Karickhoff and floaters that appeared in USA Today and 1,500 other newspapers on January 27, 2007. An article written by Dr. Karickhoff that appeared in the March 15, 2007 issue of Ocular Surgery News, one of the most widely read publications for eye surgeons.